Zest-it Cold Wax Painting Medium for use with Oil Paint. 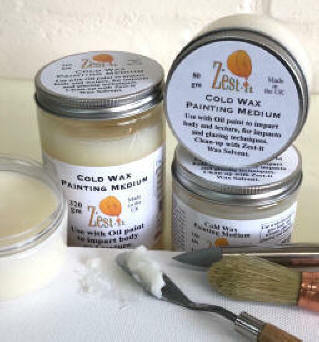 Zest-it® Cold Wax products for Artists. 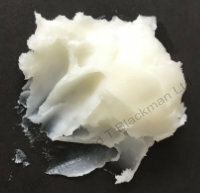 It's a smooth, thick, Wax paste, that is firm in the pot and easily moved with the palette or painting knife. Mixed with Oil paint it adds texture, body and visual depth. It increases the work-ability and drying time of wax/oil mixture, heat is not needed or recommended. The Cold Wax Painting Medium is a mixture of Natural Beeswax, Linseed Oil and Gum Damar. It took time to develop and is an evolution of numerous traditional wax painting medium recipes. The Cold Wax Painting Medium dries to a very cohesive and stable 'finish', much better than that of a beeswax candle. 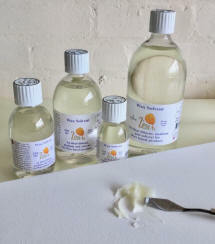 Is ideal for thinning the Cold Wax Painting Medium or a Cold Wax and Oil mixture. Add just a few drops of the solvent to obtain the consistency needed. Can also be use for thinning the wax mixture and pigment to make glazes. Like the Cold Wax Painting Medium, the solvent is non-flammable, non-toxic and biodegradable. Use the Zest-it Wax Solvent for cleaning brushes, painting knives, canvas mistakes, palettes and painting tools. After brush cleaning, decant the fluid, save and label for reuse. Zest-it oils, mediums and varnishes all work with the Cold Wax Painting Medium, they give a change of consistency to the wax/oil. Zest-it LiquiBlend Wax is non-toxic, non-flammable, creamy white in colour and made from Beeswax and Gum Damar. It has a mild resinous, citrus, waxy smell. Add as required to Cold Wax Painting Medium to liquify the working properties, whilst keeping the integrity of the Cold Wax. Because the LiquiBlend Wax thins the consistency it allows more blending of the wax. 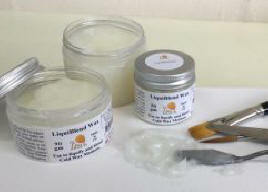 LiquiBlend Wax can be used a good vehicle for pigments, powders and solid media. Apply with brush, painting knife, roller or other tools, clean-up with Wax Solvent. Zest-it Brushable Wax Resist is non-toxic, non-flammable, it is a creamy white colour and made from renewable source Beeswax and Gum Damar. Apply to paper or other porous surface as a wax resist, the area covered with wax will retain its original colour. 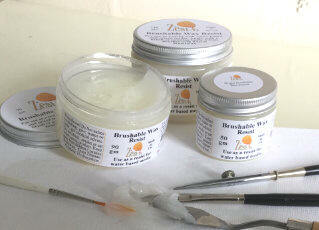 The Brushable Wax resist is best applied with a brush and a little goes a long way. The wax will resist the water media applied over the top. Dry pigment, powders and glitter can be added for different effects. Textile artists use it as a cold wax Batik. There will be other technique information soon. 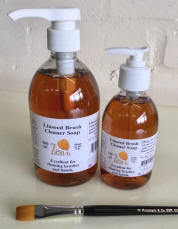 Zest-it Linseed Brush Cleaning Soap. The Zest-it Linseed Brush Cleaner Soap is excellent for cleaning oil painting brushes. Wipe most of the oil paint from the brush, add a small amount of soap to your hand and rub the brush well into it, add warm water and create a lather. Rinse and allow to dry naturally. If the paint is dried into the brush or it has acrylic paint dried on it, then repeat as above except don't rinse the soap out of the brush. Leave for a few hours or overnight and then rinse and allow to dry. Surfaces for Cold Wax Surfaces for painting. There are many surfaces onto which you can paint Cold Wax Painting Medium and Oil paint, Cold Wax Medium alone and Cold Wax with mixed media. 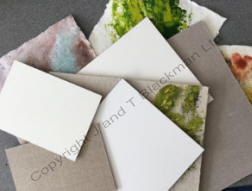 The image right shows a selection of surfaces, which include, watercolour paper, watercolour-board, oil paper, raw canvas, oil primed canvas, canvas-board, gesso-board clay-board, oil primed board....etc. There are numerous choices, perhaps only limited by the way the wax/oil will be applied. Cold Wax Painting is a renascent subject with few rules and restrictions, consequently, very freeing. Different surfaces. Bristle brushes are best for use with the Cold Wax Painting Medium, they have the strength of filament to hold the weight of oil paint and wax mixture. The brushes come in a variety of shapes, sizes and prices. 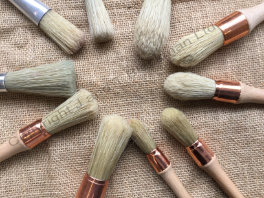 Even large round brushes, like those shown to the left, can produce delicate marks and impasto effects when the wax and oil mixture is stippled onto the surface. A selection of flat brushes will also be useful. Painting knives are a valuable tools for use with Cold Wax Painting Medium, either for scooping up the wax or for mixing with the oil paint. Knives with a 'cranked' handle are often the preferred type, they are flexible and responsive. 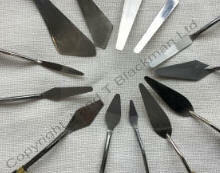 The image right gives a good idea of the types, styles and makes of painting knives available. Some have the handle welded to the blade, I much prefer the all-in-one blade for responsiveness and the tactile return of the applied mixture.